Fall is the season for fresh apples. Apples make a wonderful crunchy treat for your dog. In fact, with a few exceptions, fruit and vegetables are a great addition to your dog’s diet. Apples like many fruits and vegetables are a rich source of vitamins and fiber. Apple seeds contain substances called cyanogenic glycosides, which could cause health problems if consumed in very high quantities. Though a few apple seeds will likely not harm your dog, it is best if your dog not be allowed to eat the apple cores. For our dogs we like to cut and core an apple, mix it with just a little peanut butter and stuff it in a kong toy. Some other fruit and vegetables that your dog might enjoy include pears, carrots, broccoli, spinach, celery and bananas. 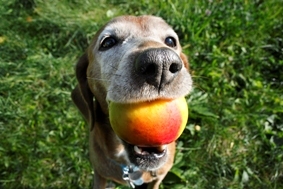 Here is a recipe for a healthy apple based treat your dog will love. Bake on a half sheet pan for 20 minutes, rotate pans 180 degrees and continue to bake 15-20 more until biscuits brown and crisp. Let cool on a wire rack then store in and airtight container.